Ian Yeung has been a choir director and church musician for over twenty years. He received his master’s and doctoral degrees in choral conducting at University of North Texas, where he held Teaching Fellowships to teach undergraduate conducting as well as directing the Men’s Chorus. He studied under Jerry McCoy and Henry Gibbons, and had classes in orchestral conducting with Anshel Brusilow. During his master’s studies at UNT, Dr. Yeung concurrently pursued a master’s degree in Music Ministry at Southwestern Baptist Theological Seminary, where he is also working towards a Ph.D. degree in Aesthetics and Worship. Since 2011, Dr. Yeung has served as the Artistic Director of Singing Girls of Texas at Fort Worth Academy of Fine Arts, where he continues a heritage of quality leadership for this prestigious auditioned ensemble. In 2015, his choir was chosen to perform for the American Choral Directors Association national conference in Salt Lake City, Utah. Prior to his appointment at Fort Worth Academy of Fine Arts, he held music faculty positions at the University of Texas at Dallas, North Lake College, and Vernon College. In addition to his teaching commitments, Dr. Yeung has served the music community throughout North Texas, including positions as artistic director of Dallas Chinese Choral Society and the conductor of Dallas Asian American Youth Orchestra. In 2008, he also founded The Vernon Choral Society, which is comprised of students, college faculty, and local professional musicians. His conducting skills are honored and refined as an active participant of the national choral workshops. In 2001, he was chosen to join as one of the conducting fellows in the Dennis Keene Festival, and he conducted and studied at the Oregon Bach Festival under Helmuth Rilling in 2002. 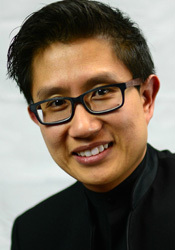 In addition to his conducting profession, Dr. Yeung has been a church musician since the age of sixteen. He has served as organist, pianist, and worship leader in Chinese churches in Hong Kong and Denton, Texas. He is also an Early Music advocate who has performed regularly as basso continuo organist and harpsichordist with different ensembles, including UNT’s A Cappella, Canticum Novum, Collegium Musicum, and Denton Bach Society. He met his wife, Michelle, while in college at the Chinese University of Hong Kong. They live in Dallas, Texas, with two lovely cats, Mango and Milo.